In the previous EUR/USD forecast we noted that the currency pair had distanced itself from the 1.34 region. The bidders of the 1.32 region seemed to have weaken as the EUR/USD approached 1.32. We noted the possibility that technical traders might want to bring upon a test of 1.32. This region is usually a strong support and resistance line. Looking at the EUR/USD weekly chart above we note that the currency pair has dipped further. It is now beyond the 1.32 support line and hence there is probably a bearish bias. 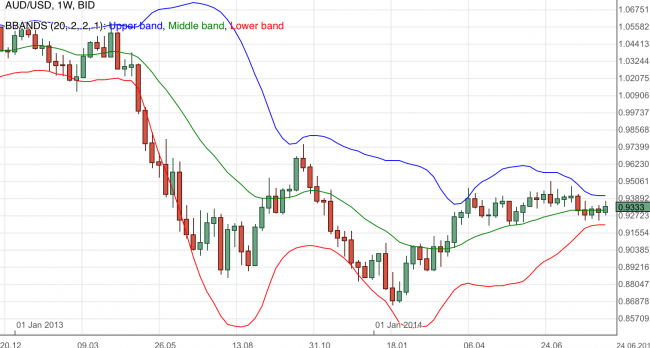 The bollinger bands are also suggesting a bearish technical pressure with its downwards gradient. 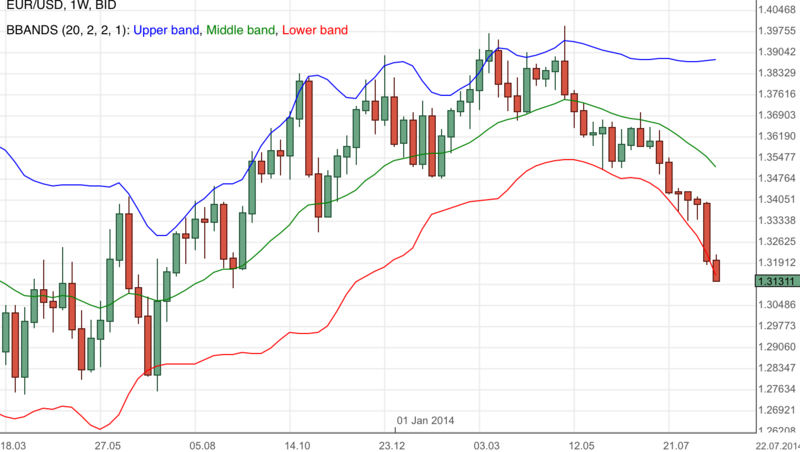 In the previous AUD/USD forecast we noted that the currency pair was in a tight trading range. The 0.94 region remained a crucial factor and hence observation was needed. Looking at the AUD/USD weekly chart above we note that the currency pair is still bounded by a narrow range. 0.94 lies right above the currency pair and hence any bullish attempt will need to overcome that too. The lower bollinger may also exert pressure as an support and hence this can serve as our immediate bearish target. Normally I do not believe that there is such a thing a a sure bet but when a central banks reputation is at stake then there is a lot on the line. While its true that a central bank is not all powerful nor is it infallible, recall George Soros and the Bank of England in the nineties, more than most players in the market it has the ability to consistently influence pries. And this take us to EURCHF, the open hostility between Russian forces and Ukraine’s security apparatus in rebel held territory has seen markets on the edge for risk aversion. This has meant that for the pair we have seen an acceleration of losses for the swiss franc. Yet the SNB has a standing commitment of a floor for the pair at 1.2000 and unlike the Soros / BoE tussle which saw the latter lose badly it is far more easier for a central bank to weaken a currency than to strengthen it. The latter needs credibility and actual demand by external parties to see a stronger currency. To weaken you need only resolve to print money ideally as inflation pressures are nil. The EURUSD was indecisive yesterday but overall still able to maintain its major bearish bias so far. The bias remains neutral in nearest term. Important intraday range to be closely watched is seen between 1.3220 – 1.3150. A clear break above 1.3220 could trigger further bullish pullback testing 1.3295. A clear break below 1.3150 could trigger further bearish pressure testing 1.3100 before challenging 1.3000 psychological support. Overall I still prefer a bearish scenario at this phase. The GBPUSD was indecisive yesterday. The bias remains neutral in nearest term. Important intraday range to be closely watched is seen between 1.6615. – 1.6535. A clear break above 1.6615 could trigger further bullish correction testing 1.6675 area. On the downside, we need a clear break below 1.6535 to continue the bearish scenario testing 1.6500 – 1.6450. Overall I still prefer a bearish scenario at this phase. The USDJPY had another indecisive movement yesterday. The bias remains neutral in nearest term. Important intraday range to be closely watched is seen between 104.25 – 103.35. A clear break and daily close above 104.25 could trigger further bullish pressure testing 105.43. On the other hand, a clear break and daily close below 103.35 could create a false breakout bearish scenario. The USDCHF was indecisive yesterday but overall still able to maintain its major bullish bias. The bias remains neutral in nearest term but overall I still prefer a bullish scenario at this phase with nearest bullish target seen around 0.9250. Immediate support is seen around 0.9125 followed by 0.9070. Looks like e are building an exuse for Gold to make a run one the 61.8 Fib retracement of the sell off the pat two months, at 1317.51. Such a move would also mean we trigger a descending wedge with a classic resistance breakout. The question here really is just what will the west do? Any hints of additional support in the military front by Europe and the US would be just the catalyst that’s needed to get things moving.